A boy standing on a frictionless ice rink is initially at rest. He throws a snowball in the +x-direction, and it travels on a ballistic trajectory, hitting the ground some distance away. Which of the following is true about the boy while he is in the act of throwing the snowball? 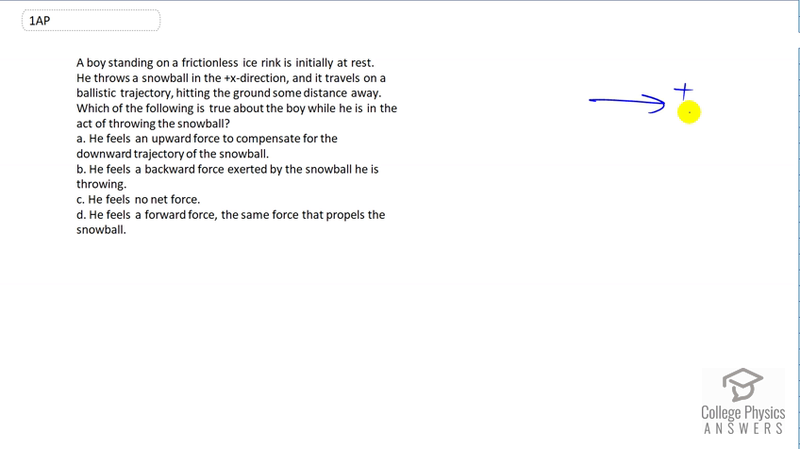 He feels an upward force to compensate for the downward trajectory of the snowball. He feels a backward force exerted by the snowball he is throwing. He feels no net force. He feels a forward force, the same force that propels the snowball. This is College physics Answers with Shaun Dychko. A boy is standing on a frictionless ice rink and is initially not moving and he throws a snowball in the positive x direction to the right. That means the boy is exerting a force on the snowball to the right, and so the snowball will in turn exert an equal but opposite the directed force on the boy. So the boy will experience a force backwards.